When one of the Rocket team ended up in hospital after having her drink spiked. We knew we had to take action. 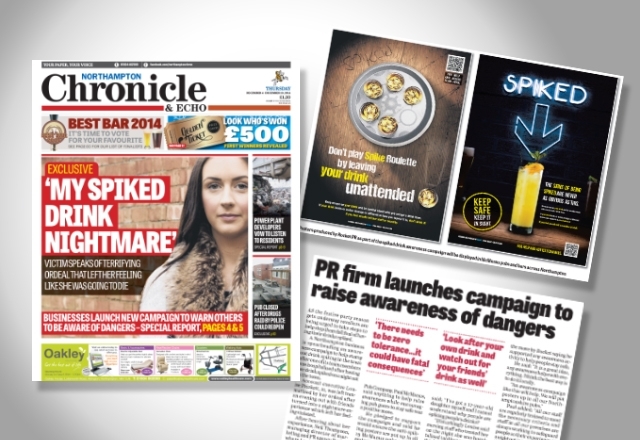 Rocket launched a high profile awareness campaign, making front-page news, to warn drinkers to stay safe. As part of Rocket’s Spiked Campaign powerful posters were created by our studio team to further hammer home the message. After hearing about Louise’s traumatic experience, Rocket Managing Director, Neil Thompson, was adamant action was needed urgently. He wanted to draw attention to the devastating consequences of drink spiking. Neil, who set up Rocket in Northampton 13 years ago, said: “After hearing what happened to Louise I felt compelled to do something about it to try to help in some way. As an innovative, creative agency, Rocket’s team pooled its skills and expertise as part of its drink spiking awareness campaign. Rocket’s creative studio team produced posters alerting drinkers about the risks of having their drink spiked. Their PR team also set writing headline-grabbing articles including Louise’s own traumatic story. Rocket’s campaign was welcomed by Northamptonshire Police alongside local pub companies in the town, including the McManus Pub Company and The Richardsons Group. Both businesses put posters by Rocket up in their numerous pubs and venues in the town to warn drinkers. Northampton Pubwatch is also backing Rocket’s campaign pledging to print posters for its numerous members. This consists of pubs and clubs across Northampton. Rocket’s campaign made front-page news in the Northampton Chronicle & Echo. The newspaper also ran a double page spread news feature inside the weekly paper. After agreeing to back the awareness campaign the newspaper featured further coverage on the latest updates. This included the support by police based at Moulton College and the Students’ Union at the University of Northampton. Both the university and college has helped spread the word about the campaign via social media. As well as digitally displaying Rocket’s warning posters, reaching thousands of students in the area. Northampton Chronicle & Echo editor and group editor of Northamptonshire Newspapers and Premier Newspapers, David Summers, said: “The Chronicle & Echo was happy to support the Spiked campaign by Rocket PR and raise awareness through our online and print audiences, particularly in the run-up to the festive period. “Everyone has heard anecdotal stories about people having their drinks spiked, but few people have had the courage to come forward and say it has happened to them. “Louise’s experience was a traumatic one and full credit to her for speaking openly about the issue. It clearly struck a chord with our readers, with many expressing support for Louise and praising her for speaking out.